The Fulbright Program in Russia | "What Is Experiment?" Yulia Kleyman, Fulbright Visiting Scholar alumna of 2012-13, supervised the educational program "What Is Experiment?" as part of the IV Summer Arts Festival "Access Point". 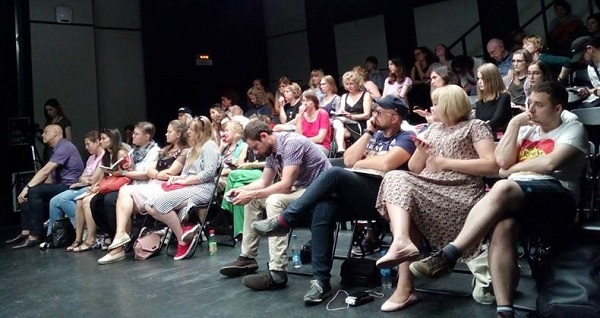 The program took place from July 31th to August 2th and offered lectures, director's lab, viewings of plays and a final seminar. More than a 100 people participated in the program, including Fulbright scholars, students and teachers of the Russian State Institute of Performing Arts (St. Petersburg), Moscow Higher School of Social and Economic Sciences (Moscow), Russian Institute of Theatre Arts (Moscow), Presidential Academy of RANEPA (Moscow), directors and theatre experts. Among the participants was the group "Art Baggage", winners of the scholarship contest awarded by the Russian Union of Theatre Workers. The group includes the most active regional participants of the theatre process (directors, theatre directors, etc.). Apart from Yulia Kleyman the educational program also was attended by other Fulbright fellows: Alla Shenderova (Visiting Scholar, 2017-18), Farrah Karapetian (U. S. Scholar 2017-18), Arina Slobodyanik (Visiting Graduate Student, 2017-18), Elena Yushkova (Kennan, 2007-08), Anna Shulgat (Visiting Graduate Student, 2006-07), as well as Joel Ericson, Director of the Fulbright Program in Russia. Last year Yulia curated a scientific theater conference "Revolution in the Theater Space", which she hosted on on July 25-27, 2017, also as part of the "Access Point" festival.